At Sharp, we like to think of ourselves as sheet pan connoisseurs, always searching for the most flavorful recipes to bring to the table. 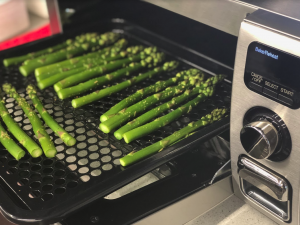 In fact, earlier this week we found ourselves experimenting with the NEW Superheated Steam Countertop Oven and fully using its large broiling tray to our advantage. With almost 40% more cooking room than the average quarter-sized sheet pan, there was plenty of room for the whole team to join in on the taste-testing festivities. 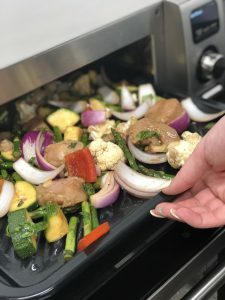 We started off by researching delicious sheet pan meals on our Pinterest board and thanks to Skinny Taste, settled on a delicious recipe for Sheet Pan Balsamic-Herb Chicken and Vegetables. 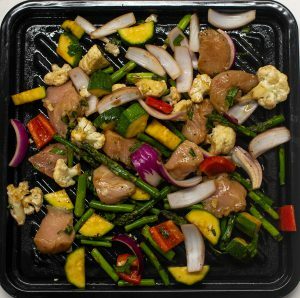 Since only a short meal prep and cook time required, this 30 minute sheet pan dinner is a game changer in our book. Just look at our before and after results! Alright, let’s get cooking. 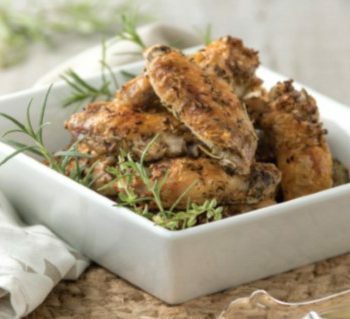 Start off by combining your chicken with 1 tbsp of balsamic vinegar, 1/2 tbsp olive oil, garlic, 2 tsp dried basil, 1 tsp dried parsley and salt into a medium bowl. You will want to seal the bowl and allow the chicken to marinate while you prepare the vegetables. In a separate large bowl, combine all diced and chopped vegetables with 2 tbsp balsamic vinegar, 1 & 1/2 tbsp olive oil, basil, parsley, and lightly season with salt & pepper. Once your vegetables are marinated and mixed, combine your chicken and vegetables onto your sheet pan. 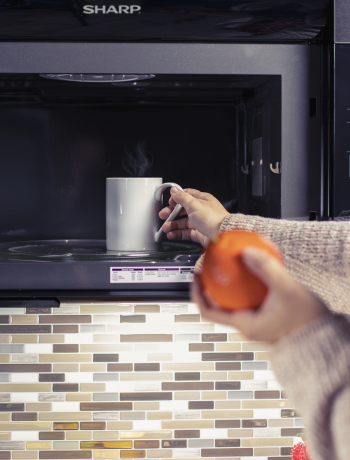 Turn your Superheated Steam Countertop Oven on instantly and set to 485 degrees (no preheating required). Place your sheet pan into the oven and allow about 20 minutes cook time or until the chicken is cooked through. Our team loves cooking with steam because of the delicious added texture it brings to our food. 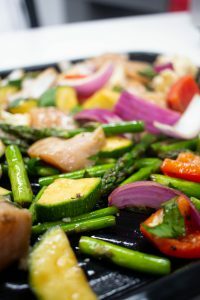 After creating this delicious sheet pan dinner, we found the asparagus and cauliflower’s texture more firm and moist in the Superheated Steam Countertop Oven than in a traditional oven. Likewise, we found that our chicken breasts were tender and juicy, with minimal dryness from the high temperatures. 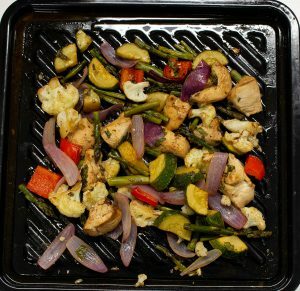 All-in-all, our team was amazed at the tasty and full sheet pan dinner we managed to create in less than 30 minutes. 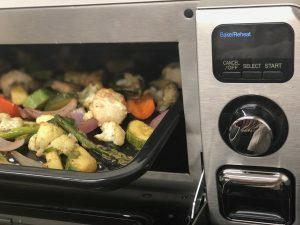 With such a new method of cooking, many of our friends at home are curious to know what Chef’s like Eva from Reno’s Appliances make in their Superheated Steam Ovens. While superheated steamed fish and chicken are a home run, many cooks express the challenge of knowing how long to place their vegetables in the oven for. When asked about how Chef Eva prepares her vegetables in her Sharp ovens, she explained that she “tends to steam vegetables without any seasonings and then toss with a little freshly made lemon vinaigrette (lemon, olive oil, capers, shallots, garlic and a fresh herb) to to the warm vegetables. This keep the integrity of the flavor of the vegetables honest and doesn’t over season them” . This simply mindful way of preparing vegetables is beneficial for chefs looking for natural flavors in their dishes. Eva went on to explain that she “tend to set the timer for vegetables to be very al dente, since in real life, [she] rarely takes them out the moment they are done. It is much easier to add a minute or two if needed but once vegetables are mushy, there is no salvaging them”. Interested in testing out more simple and delicious recipes? Check out our simply better recipes here. Once your done, show us your new sheet pan creation on Instagram by using the hashtag #SharpSheetPan. Looking for more on steam cooking? Check out the following links found below.